JSC Aviasystems is a consolidated Оperator of the material and technical support of the operation of aircrafts Tu-204/214, Il-96-300 / 400, An-32, An-140, An-148, Be-200ES-E as well as a consultant in the field of the operation of foreign aircrafts. The Operator's activities are aimed at the organization of the Pool of spare parts to provide "support" the on-board equipment of domestic aircrafts with the repair, supply, lease and exchange of aviation components and spare parts. History of the JSC Aviasystems establishment starts in 1998 when a group of the aircraft engineers, specialists in the field of flight simulators and developers of the test and control equipment was involved in a problematics of the new generation TU-204 and IL-96 airplanes aftersale support. In the course of the works it became clear that one of the aftersale support most burning issues is a lack of the system approach towards the aviation-logistic support (ALS). Besides, no specialized organization existed in the market, which was able to solve all the TU-204 and IL-96 spare parts problems in favor the operators - starting from supplies and leasing of the airplane components and ending with provision of the airplanes repair services. As a result, the airlines - operators of the TU-204 and IL-96 airplanes - were offered for the first time a services package for material and technical support (2001), which included not only units, nodes and aircraft electronics (avionics) repair, but also a provision of the similar components leasing, including a "gate-to-gate"transportation. After studying of the western approaches towards the turnover and components repair organization (2003) the privately held company Aviasystems strarts a realization of the "Rotating pool of the shared use" project, which is often called the "Spare parts rotating pool". Main idea of the above mentioned project was to unite all the components stocks in a single database and a master management of these stocks to the favor of operators (airlines). As a result of the selected strategy systematic realization the first virtual "Spare parts rotation pool" was launched up to 2007 in the civil aeronautics. Current pool united in itself the stocks of the biggest Russian operators under control of the single Operator - the privately held company Aviasystems. The Pool building principles were settled in the special "Memorandum of the spare parts rotation pool"(on Russian), which was signed by general directors of the airlines. Up to the middle of 2008 the Operator managed to support serviceability of aircraft hardware for 20 vehicles of the TU-204/214 and IL-96 models operated by Russian airlines. The Pool system passed the challenge in 2009. A part of the airlines became bankrupt and was forced to leave the shared use system in the context of crisis on the aviation-related market. The Operator managed to replenish the missing components in the Pool thanks to the spare parts leasing. Today the JSC Aviasystems supports the aircraft hardware serviceability of TU-204/214, IL-96, AN-148, Be-200ES-E models, which are operated by the following airlines: JSC "Red Wings", LLC "Business Aero", Regional Centres of EMERCOM of Russia, JSC "Angara Airlines", LLC Aviation Company "Aviastar-Tu", Federal State Budgetary Institution "Special Flight Squad" Russia " and others. One of the company's activities is the implementation of the project "Pool of spare parts for Mi-8MTV, Mi-8AMT / 171 helicopters". The pool was created during the period from 2014 to 2017, in cooperation with the largest Russian operators of this type of aircraft and repair organizations (OAO NPK "PANH", CJSC "AK" Aviashelf ", LLC" Aviation Company "Yamal", JSC "Uteir Engineering"). 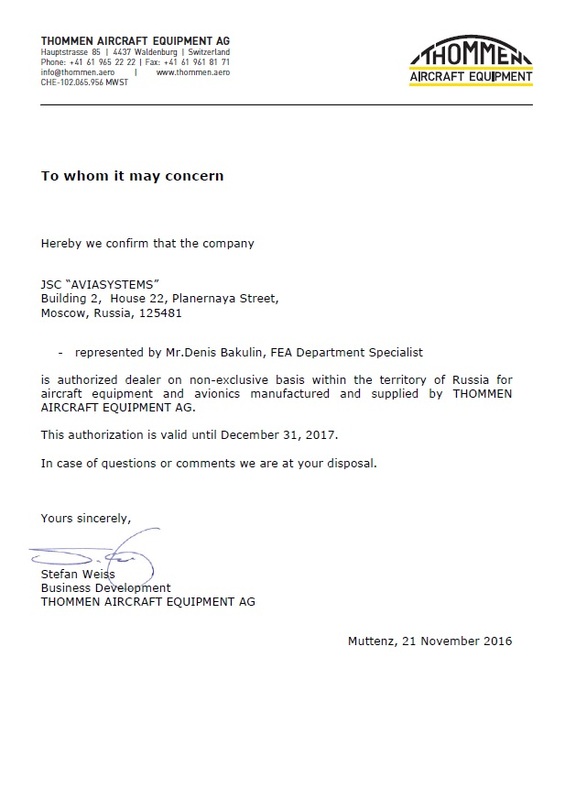 Nowadays the project is "suspended" due to unprofitability due to the lack of modern Mi-8MTV / AMT helicopters on the market. In case of a massive decommissioning of the Mi-8T aircrafts in the coming years, the company intends to continue the implementation of the project. In 2016, the company Aviasystems has created a Pool of spare parts to maintain a fleet of aircrafts Be-200ES-E, the Russian amphibious aircraft designed by the Beriev Aircraft Company. At present, manufacturing plants and component developers are involved in the multiple user system of spare parts for the Be-200ES-E. Created Pool of spare parts should become the basis for supporting the operation of all Be-200ES-E amphibious aircraft operated by the EMERCOM of Russia. A separate sort of the Operator activity is a realization of cooperation programs with the developers and manufacturers of the components. The exclusive service agreements were signed in the context of above mentioned activity with a whole range of the key avionics suppliers. The Operator with manufacturers create the objective rotating pools including the components supply to the aircraft home during 24-72 hours. At the moment, the company is implementing a program of cooperation with the company THOMMEN AIRCRAFT EQUIPMENT AG for the rental, repair and supply of the air signal system (barometric altimeters) AD-32. The company framework of reference was significantly expanded in 2005 thanks to the "Consulting" department establishment, which provides consulting services for the Russian operators and organizations concerning the foreign aircraft maintenance and repair. A collaboration with the market players in order to gain the European Compliance Certificates (EASA) Part- 145 - 147 - M, -21, CS-25,-23, -27, -29 is included in the framework of reference of our consultants. Besides, our specialists provide independent audit in favor of the operators and owners of the aircraft. A whole range of the projects concerning the foreign aircraft exploitation training by the specialists of the airlines was realized for the past 13 years. A series of the innovative programs of flight security management and in order to support an air worthiness were also developed. Besides, the Operator managed to fulfill a complex training of the airlines specialists concerning responsibility centers, implementation and support of the airlines and organizations quality management systems on the base of the aircraft maintenance. Starting from 2010 the "Consulting" department offers to its clients the marketing researches in the field of aircraft, gears and components technical maintenance and repair services. Besides, the department fulfils the special researches in order to define the foreign aircraft market demand of the spare parts. In 2010, our experts have obtained the auditor's certificate IS-BAO (International Standard for Business Aircraft Operations) of the International Business Aviation Council (IBAC), which enables to conduct the audits of operators of business aviation aircraft and helicopters. The standards of IS-BAO are accepted by the aviation authorities of the USA, Europe and are obligatory for registration of business aviation aircraft and helicopters in aviation registers of Bermuda Islands, Aruba, and Cayman Islands. Amongst the consulting companies in Russia, only JSC Aviasystems has certified specialists able to perform such kind of works. Today JSC Aviasystems has already signed agreements with more than 80 Russian and foreign aeronautic plants concerning the components maintenance and repair, general cooperation agreement with the PJSC "Tupolev", PJSC "VASO", PJSC "Beriev Aircraft", PJSC "GTLK". The company's quality control system is approved by the certificates № (ATI) 270317.038 of 04.04.2017, № (ATI) 120916.038 of 31.10.2016, № (ATI) 080813.038 of 28.08.2013, № (ATI) 230312.042 of 14.05.2012, issued in the context of the Voluntary Certification System of the civil aeronautics of the State Civil Aeronautics Research Center and license of the Ministry of Industry and Trade of the Russian Federation № 14119-АТ of 28.04.2017. The progress of JSC Aviasystems could not be achieved without a meaningful dialogue with the civil aeronautics and appropriate industry market players, contacts with the aircraft authorities. The company activity is highlighted on the regular base in the leading industry press, "Air transport review", "Aviaglobus", "Air transport" magazines. Particular attention is paid to the participation in the theme-based conferences, aeronautic forums, International Aviation and Space Show "MAKS".